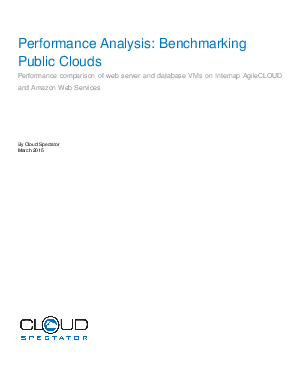 Internap commissioned this benchmarking analysis to examine the relative performance of major VM components including virtual cores, memory, block storage, and internal network for Internap AgileCLOUD and Amazon Web Services (AWS) EC2/EBS. Specifically, the study examines raw performance and price-indexed performance for two common workloads: web servers and databases. Findings from the study show that Internap AgileCLOUD provides better raw performance and price-indexed performance than AWS.